I remember hearing about the Nusa Islands off of Bali in Indonesia years ago. People said it was like Bali used to be before the tourism and development took over. Ever since I’d imagined how it would be – jungly, with friendly people and rocky roads, rugged beaches, and hidden treasures. When I arrived in Nusa Lembongan, the most popular of the three Nusa Islands, I was disappointed. It’s built up and even those tiny roads can feel hectic at times. It had me wondering if I’d missed the timing on the Nusa Islands. Then I went to Nusa Penida, the largest and least popular of the three, and found a gorgeous island that those of us who chase off the beaten path places would consider a paradise. Most people just visit Nusa Penida on a day trip and miss the coolest parts of the island – but this is good news for you and me, since that leaves so much of the island free to explore without crowds. I spent four days on Penida but wish I’d had longer! 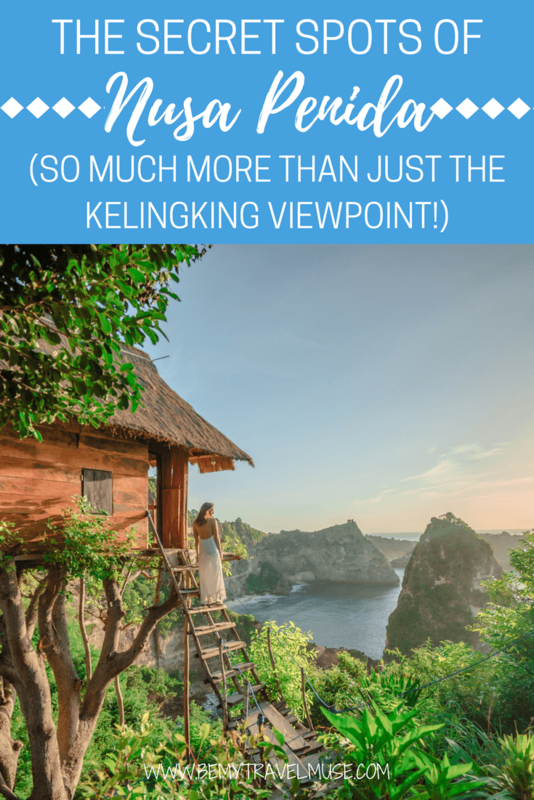 Most day trippers head straight for the most famous photo spot in Nusa Penida: Kelingking viewpoint. From there, it’s a steep climb down to a white sand beach that will require scrambling hand and foot in some parts, but if you can make it down, it’s gorgeous and worth it. We should probably also establish now that Penida is all about cliffs and stairs. You’ll be getting a workout on this island but hey it offsets the gado gado and fried tempeh so it’s all good, right? To avoid the crowds, head to Kelingking earlier in the day or later in the afternoon to enjoy it without the day trippers. Other favorites include Crystal Bay, which is a cove with clear blue water but to be honest, lots of people and boats, and Angel’s Billabong and Broken Beach. Angel’s Billabong is a crystal clear natural pool and Broken Beach features a hole in the rock that has been eroded over time by the powerful waves. Both are beautiful but also very popular with day trippers. You’ll also find that there are many rock formations with holes in them all over the island if you explore further than the northwest coast. The port area on Nusa Penida is where most tourists stay but I found the vibe and views from the middle of the island to be so much better. Picture locals from tiny children to old grannies saying hello and even blowing kisses, big fat pigs oinking from the shady roadside, and tiny villages with no foreigners around and you’ll know what I mean – it all exists in the central parts of the island. I rented this AirBnB (get $25 off here) for a couple of days on the island and true to the reviews, it was one of the best places I’ve stayed during my time in Southeast Asia. The sunset views are just incredible, including the view of Bali’s Mount Agung pictured above from the dining area. It was full of butterflies and dragonflies too. It felt like pure magic to me. It’s a great jumping off point for many of the activities around the island as well due to its central location. I promised stairs and we are delivering stairs with this spot – about 750 of them to be exact! I think we should also talk about the lack of waterfall. Could you still be convinced to go, though? This is less about the ‘waterfall’ and more about the views on the way down and back up. Get the experience of a sacred temple while watching the powerful waves smash into the cliff face in a powerful display. It’s also a chance to complete a rite of passage that every Balinese Hindu is expected to do in his/her lifetime. Most tourists who visit Nusa Penida probably have no idea that this is known locally as the ‘black magic island.’ Nusa Penida has historically been the island where the evil and dark spirits were banished to by priests on Bali’s mainland. However Balinese beliefs strongly emphasize balance – both of the good and the bad. Therefore for the Balinese, Penida is an important spiritual destination. By visiting this temple where fresh water runs into the sea (the ‘waterfall’) you get to be part of this pilgrimage as well. If you open yourself up to it, you can feel a profoundly strong spiritual presence there. To visit, I recommend sturdy shoes, plenty of water, and a sarong. This one could be tough for those with a fear of heights as the stairs are only about a half a foot-length each. Looking back at these photos now I have to pinch myself and ask if it was all just a dream. Following a lovely stay on the top of the hill, I moved east to this treehouse for a night of watching the moonlight and sunrise over the bay at Atuh King Five – an outcropping of islets near Atuh Beach. This was great for just one night – though there are some drawbacks. The climb down to the treehouse involves, you guessed it, more steep stairs! The room is incredibly basic and overpriced, it sways with every movement, and the bathroom leaves much to be desired. You’ll have people asking often if they can take pictures on the stairs, or maybe just climbing right up before asking, but at night you will mostly get it to yourself and you really can’t beat this sunrise view. It’s real. I know, hard to believe! If you stay, be sure to bring food and water along with you. It’s a beautiful and rustic experience! Read my full review of the treehouse here. You can book it here (and get $25 off here). Are you ready for more stairs? I can feel your excitement from here! All kidding aside, if you can embrace another afternoon of exercise, this white sand beach is fairly secluded and the water color is stunning. Sadly when I was there a lot of trash was washing up on the beach. This is a huge problem all over Indonesia and Southeast Asia in general. Still, it was nice to get a beach almost all to myself and to get some exercise while I was at it. There are 350 steps (I counted!) but they’re big, steep steps and the climb is about on par with all the others mentioned on this list. In my experience it’s usually around $100 for a boat for the whole day, visiting various different snorkeling spots. To me this will always beat an organized tour. You can ask the people at your guesthouse to help you organize this or do it in person yourself with the boatman. Unfortunately there are no boats from Bali or Lombok that go directly to Nusa Penida. Unless you take a day tour, you’ll need to head to Lembongan first and then take a boat over to Nusa Penida. Click here to read about the ferry schedule and options to Lembongan from Bali. Once on Lembongan you have two choices for getting to Penida – you can ask to be dropped off at the mangroves and hire a private boat for around 400,000 IDR, or you can head to the yellow bridge and take the public ferry which costs 50,000 and leaves periodically when full. If you take Scoot or Rocky Fast cruises they both include transport to the bridge or mangroves in the boat ticket price. Want more visuals? Here’s a vlog! 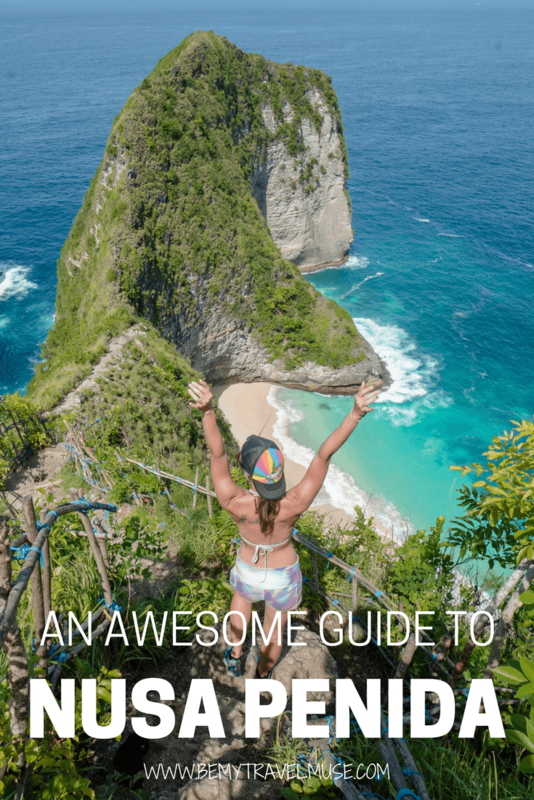 I hope this guide helped to convince you to spend more than just a day on Nusa Penida. I think most people have it all wrong by spending the bulk of their time on Nusa Lembongan and only popping over to Penida for a day trip. The real magic of the Nusa Islands is on the mystical island! For more on the other two islands, click here to read about Ceningan and here to read about Lembongan. After seeing your posts Nusa Penida is becoming a destination I’d like to go to. I’m in Indonesia once or twice a year so it’s definitely something I could do. I am a solo traveler but do not ride a moto. Is is possible for me to get around the island if I don’t have my own transportation? Also did you find the water for the manta snorkel/dive really cold? I have read it’s a part of Indonesia with cold water which has kept me from diving there. You can request a shortie! I’m from California and used to super cold water so to me the water in Indonesia is super warm to me. It’s worth it! I would make a friend whose motorbike you can ride on the back of, or you can join day tours around both Lembongan and Ceningan, or learn to ride, but don’t make Nusa Penida the place where you start. Those roads are pretty bad! There are many boats leaving from sanur directly to nusa penida… for example the crown ferry company. So good to know, I didn’t think there were any! I’ve used the first departure, forget the name of boat but we got it from gilitransfer.